Fringe regulars The Beta Males are love bombing Edinburgh this year. The four man troupe star in Happenstance at the Pleasance on an evening, while they’ve split into duos for afternoon shows. Both duos, incidentally, claim to contain the two best ones. A duo they may be, but Richard (Soames) and The Storybeast (John Henry Falle) aren’t a double act. Each takes their very different turn on stage, alternating every five minutes or so. It worked well, and ensured that the pace and variety were maintained throughout. Richard has something of the young Angus Deaton about him. He kicked off, in character, and while he can appear the everyman, he’s got layers to peel off revealing his character’s eccentricities. The Storybeast is decidedly not an everyman. He appears as an over the top Bardic character, reciting the Old English epic poem Beowulf with a few modern words and references thrown in. 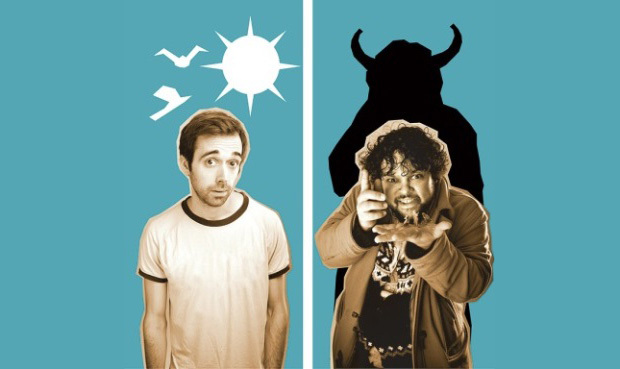 Taking turn about, Richard showed he’s a good character comedian, while The Storybeast interspersed Beowulf with slightly unhinged and maniacal characters. Different they may be, but the two performers complemented each other excellently and there were laughs aplenty for both from the appreciative audience. Behind the good performances was good writing. Their best material is excellent: only in the duo’s final solo spots did the quality dip slightly, hence the three star rating. That said, both performers combined well for a big ending. There’s great value to be had on the Free Fringe.